There are six names below, four of whom are gone, leaving....three? Second Base - The market for second basemen is so thick you can take your pick. I'm budgeting up to $7 million for Placido Polanco, Freddy Sanchez, Mark DeRosa, Orlando Hudson or Felipe Lopez. Heck, I'll even jump on Akinori Iwamura if his option isn't picked up. I'm not that concerned about which one, and I'm not hesitant to offer a multi-year deal. In fact, I'd love to not worry about that spot for the next few years. Sorry Alexi. You're on my bench for now. Iwamura was traded to someone else though it looks like the Twins were poised to get him, and he'll be paid just $4.25M this year. Sanchez stayed with the Giants when both sides agree to $12 million over 2 years. DeRosa also signed with the Giants, presumably to play third base, for $12 million over 2 years. That leaves two guys and the sentiment above still applies - I'm not that concerned about which one. That doesn't mean they're the same guy. Orlando Hudson is perceived as being the safer bet because he's been so consistent. For instance, here are his on-base percentage of the last 4 years (the league average is about .340): .357, .367, 376, .354. He's also won a Gold Gloves at second base in 2005, 2006, 2007 and 2009. That's the kind of consistency that edges a player over the other mediocre free agents. By most accounts that's where Hudson is right now: considering offers, making a choice, and setting the market for several remaining free agents. The biggest concern about Hudson, a late-season benching, is likely overblown. He was benched at the end of last season in favor of Ronnie Belliard, who the Dodgers had acquired in a last second trade. The story was spun that Hudson was benched because L.A. didn't want to pay him various plate appearance incentives in his contract, but Hudson reached all those incentives anyway. It's more likely that he was benched because Belliard was white-hot (he posted a 1.034 OPS with L.A.) and Hudson was brutal (batting just .227 after August 31st). The concern shouldn't be whether Hudson had a bad year. He didn't. He posted respectable numbers, made more respectable because Dodger Stadium depresses hitting statistics. The concern should be about why Hudson was brutal at the end of the season. It looks like he was hurt, missing time with a strained groin a couple of seeks before Belliard was acquired. Injuries have nagged at Hudson throughout his career. And now he's 33 years old, and second basemen lose their legs quickly, and the defensive metrics say that his reputation is higher than it should be at this age. That doesn't mean he's done. It just means that even with all that consistency there is some risk too. Felipe Lopez, in some ways, is exactly the opposite. Once upon a time he was a potential star, even hitting 23 home run as a shortstop for the Reds as recently as 2005. Then he was traded to Washington where he struggled for years. As soon as he left that team he was seemingly reborn putting up positive offensive numbers for the last two years, even exceeding Hudson last year. The promise of being a power-speed combo shortstop is long gone, but Lopez has settled into a second baseman who hits a half dozen home runs and steals a half dozen bases but whose ability to get on base varies from year to year. Defensively, he's hard to judge. We know he was a bad shortstop, but he seems to be at least passable at second base. Metrics like UZR don't help much since they've been wildly inconsistent. But last year they were very positive, far outpacing Hudson, though he has nowhere near the defensive reputation of Hudson. You lose the consistency with Lopez, but he's on a 2-and-a-half year upswing. He's also two-and-a-half years younger than Hudson, meaning you could sign him for a two-year contract and when he finished it he would still be younger than Hudson is right now. Neither of these guys are all-stars. Neither of these guys are without risk. You could even argue that given their middling offensive production, neither is that appealing unless you are a team desparately needs a right-handed hitting, good-fielding second baseman that can get on base a lot. Which, of course, the Twins are. And now we're hearing a third name, one which Twins fans are more familiar with. A few months ago I wrote that there was zero chance Orlando Cabrera returned to the Twins to play second base. I was wrong. Major League Baseball has collectively decided that Cabrera is no longer a shortstop, and he and his agent have switched their focus to second base. Cabrera is right-handed, but he's older (35) than these guys. He's worse and getting on base (.313 last year). He hasn't played more than three innings since 1998. There is no way I can rank him at the same level as Hudson or Lopez. But we need to recognize that statisticians don't have the market cornered on what wins ball games. Cabrera has now appeared in five postseasons over the last six years, consistently finding himself on successful teams, and to me that counts for something. He also had a significant impact on the Twins playoff run last year, both anecdotally and statistically. So he's making my list of guys I'll be thrilled to see added to this team. And more than a little bitter if they don't. First, a reminder - you can follow me on Twitter at Twitter.com/twinsgeek. And I say that because I hope to tweet from TwinsFest this weekend. I'm afraid I don't know exactly when I'm going, but I'll tweet when I'm there. Last night was the deciding game nine for the Dominican Winter League Championship. And taking the hill for the winning team was our own Francisco Liriano. He's been putting up ridiculous stats this winter. And every time we want to talk about them, we feel obliged to point out that this is just winter league, and the success might not translate, blah, blah, blah. It was 2006. Like when I would sit in the dome, and he would come in for relief, and you would watch a batter that didn't have a chance, and then turn to a total stranger a row away and both be just shaking your heads with these $hit-eating grins on your face. It was like that. I'll say it - my expectations are sky-high for him this year. I'm more of a "show me" guy when it comes to prospects and winter leagues, but Liriano showed me tonight. Don't tell me about the competition there. It wouldn't have mattered if he was facing AA ballplayers or the Yankees. Nobody was going to do much with those pitches. There have been some rumors going around that maybe a deal for Joe Mauer could get done soon. Just so we set expectations a little, I thought it might be a good idea to see what the top free agent hitters were paid over the last four offseasons. So where would you rank Mauer in that list? He's younger than any of them, so he could get as long a deal as anyone. He certainly outranks the guys who didn't clear $20 million per year. But it's probably not feasible for the Twins to pay him as much as the Yankees paid their free agents. It sounds to me like a nine or ten year deal is feasible, and it would average at least $20 million per year. That's probably the minimum of what he's worth. The next question is "How much is too much?" But I don't think I want to think about that just yet. "The Nationals and Rays both are pursuing [Orlando] Hudson, but his negotiations remain fluid, major-league sources say. At least one, unidentified team might still be in the mix. That team could be the Twins, who are known to have interest in Hudson, major-league sources say." Don't you toy with me Fox Sports. Don't you DARE toy with me. 6.3. review age of candidates? So that's the plan. It's not hard - it really does write itself. But I'm tired, I have a chess club to organize, I promised my kids I'd watch a movie with them tonight, and best of all Ken and Jon Paul at Fox Sports bought me at least a slight reprieve. There's going to be a lot of discussion about Jim Thome's potential value to the Twins in 2010 - how he can platoon with Delmon Young, rest Justin Morneau occasionally, be a presence in the clubhouse and provide a nice late-inning option for manager Ron Gardenhire. Just scroll down those blogs over there on the lower right, and you'll get plenty of solid analysis on all these aspects. But I want to concentrate on just how valuable a bench bat is when used in late-inning situations? I've wondered about this since 2002 and 2003 when that role was often filled by Bobby Kielty. I remember writing about a quote from Ron Gardenhire stating that he thought Kielty was more valuable as a bench option than an everyday player, because that one 9th inning at-bat could be in a more valuable spot. That's the kind of statement that makes disciples of advanced metrics like WAR throw up in their mouth a little bit. But it's also the kind of statement that makes disciples of advanced metrics like WPA applaud. Because it is undoubtedly true that a late inning at-bat can be much more valuable than an early inning at-bat. What isn't clear is how much more valuable, and whether it really makes sense to reserve a player for just those situations. So with Thome joining the club, I crunched a few numbers for your digestion and comments. Let's start with a scenario. Imagine a player on the home team leading off an inning with a home run. How much does that home run really help the ball club? That axis at the bottom is innings. So if you look at the dark blue line (which represents when the home team trails by a run), it shows that if the home run leads off the first inning, it improves the teams chances to win by just over 10%. 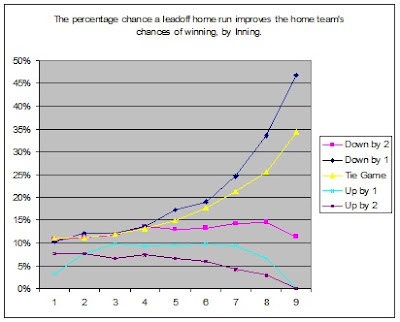 But if it happens in the ninth inning (where it ties the game), it improves the team's chance to win by over 45%. Think about that: the same hit, in the same situation but in a later inning, is four times more valuable in the ninth inning than in the first inning. The temptation for people studying players is to write this finding off. After all, there's plenty of evidence that players aren't clutch. Thome can't choose to hit that home run late in the game as opposed to when it has less value. So from a player's perspective, when trying to determine their overall value, we focus on the raw numbers and not when it happened. But we aren't really studying the player in this case - we're studying the manager. And the manager DOES get to make a choice. He gets to choose the best situation in which his bench players get to bat. Thome might not be more clutch in that position, but he's significantly more likely to hit a right-handed pitcher silly than Brendan Harris. If he hits a home run in that ninth inning of a one run game, it's more valuable than if he had hit a lead off home run in the first, third and fifth innings combined. 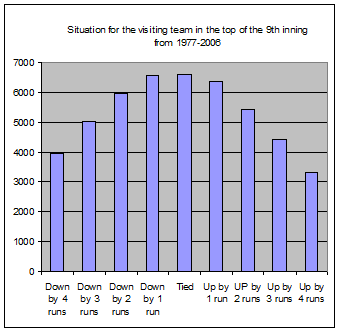 Of course, the chart also shows that it's significantly different if the game isn't a tie game or the home team isn't losing by just one run. If the home team is winning, putting that slugger in late innings to jack a ball into the right field bleachers doesn't add much, as the game is almost decided. That's fine - so keep in the defensive specialist. And if the home team is down by two runs, it's actually considerably more valuable to hit that lead off home run in the eighth inning than in the ninth, since it gives your team more time to come back. So just how often do baseball games enter the ninth inning fairly close? Below you'll see some numbers for games between 1977 and 2006. I'm afraid I don't have percentages for you, but you can see close games are the most common occurrence, but not necessarily overwhelmingly so. Finally, I should mention that I only charted the value increase of a specific outcome: a lead off home run. What if he struck out instead. I suspect that the difference isn't quite as pronounced with other outcomes, but the trend is similar. An out in the ninth inning of a one-run game is more important than an out in the second inning. No matter what outcome you choose, in the late innings success counts more and failure hurts more. Either way, the manager wants to have a very good hitter available. And now, he's got one. When the Cleveland Indians opened up Jacobs Field in 1994, they were in a bit of slump. Kind of like Delmon Young has been in a bit of slump - since 2006. But believe it or not, the Indians' slump was worse, because it went back about 35 years. They hadn’t been to the playoffs since 1954. They had just six winning seasons since 1959. And since 1947 they had played in Cleveland Stadium, derisively referred to as The Mistake by The Lake. That was about to all change. The opening of Jacob's Field corresponded with a surge of talent from the Indians farm system. The anticipated revenues from the new stadium led to a tripling of payroll from $8 million in 1992 to $28 million in 1994. The popular story is that the Indians used that money to tie young, talented players to long-term deals and fuel their astounding success for the latter half of the decade. That's only half the story. They certainly had success. Their win rate improved +26 games(!) on average between the five years before The Jake opened and the five years after the Jake opened. And there's no question that they were able to reward and keep homegrown talent like Kenny Lofton, Charles Nagy, Jim Thome, Albert Belle, Omar Vizquel and Manny Ramirez with the revenue from the new stadium. In 1998 they traded for third baseman Travis Fryman, who was just 28 years old and would finish his career with Cleveland. In 1999 they signed a 30-year-old Roberto Alomar to a five-year contract to play second base. He responded with three unbelievable seasons before being traded to the Mets to finish out the contract. In 2000 they paid pitcher Chuck Finley $28 million over the last three years of his career. In 2001 they signed Ellis Burks as a free agent and paid him over $18 million to DH for them over the next three years. In each case, the Indians used their payroll to acquire a high-end player at a position of need and extend the organization's success from the late 90s. It worked. The Indians posted a .585 winning percentage from 94-2001, which translates to about 95 wins over a 162-game season. That included a 100-win season in 1995, six trips to the playoffs and two trips to the World Series. The model for success had been built, and numerous MLB teams tried to copy it. But only half of the strategy was trumpeted by the baseball public. Yes, a strong farm system and long-term deals had established a base for the success. But Cleveland's management raised the level of their team from "good" to "elite" by spending money strategically on high-end players outside of the organization. The preceding is loosely based on a much (much, much) longer story I wrote for the Maple Street Press Minnesota Twins Annual, coming to a magazine rack near you in March. (Or you can pre-order it here.) The story is a comprehensive review of what other "small market" teams have done with their new found revenues as stadiums opened. Tuesday Night on Seth Speaks Podcast, he's going to have a special two-hour show featuring so many minor league Twins prospects that I can't name them all. Make sure and check it out.